Get the free Sanctum Secorum #33 Companion HERE! Retired master-thief Satampra, Zerios of Uzuldaroum recounts an adventure from days gone by when he and his two companions (Vixeela and the dubious magician/alchemist Veezi Phenquor) endeavored to rob the temple of the moon god Leniqua, and steal away with the Thirty-Nine girdles of virginity by means of stealth, cunning, and a little bit of hyperborean chemistry. 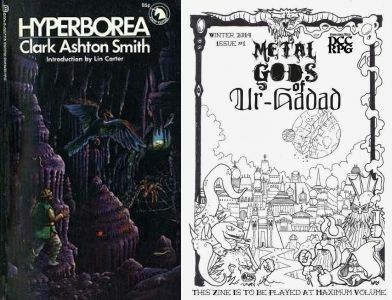 Originally published in the Saturn Science Fiction & Fantasy, it is the last of Clark’s Hyperborea cycle. Welcome to the Sanctum Secorum podcast. Tonight we look at a work by Clark Ashton Smith, The Powder of Hyperborea and match it up with Edgar Johnson’s delightful Street Kids of Ur-Hadad.